We want to take a moment to recognize the most important people in the world of Devastator: our brilliant, abnormally intelligent subscribers! If a comedy magazine is printed in the woods, but it's never sent to folks via the mail, is it... y'know, a thing?�Holly is a reality show producer, a sister of somebody on staff (but who?! ), and June's Subscriber of the Month! 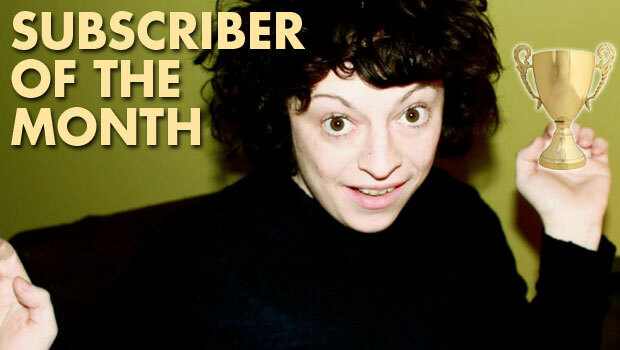 Holly Golden, you are now one of the few, the proud Subscribers of the Month. How did you attain admission into this elite club? Well, I had to take the written and practical exams, like everyone else -- I took them 3 times, actually, before submitting my scores. My 3.9 GPA and extensive list of extracurricular�activities�probably counted in my favor. Oh, I am also the sister of Editor-in-Chief Geoffrey Elizabeth Golden. You're the Director of Development for 25/7 Productions, which makes reality TV shows. Are you concerned this interview will be edited to make you seem crazy? I am not concerned about that! �I just want you to make me sound as interesting as possible, because I know that any kind of publicity is good publicity! �Or at least, that's what I tell all the stars of my reality shows. If you could force any person or group of people into signing off on a reality show about their lives, who would you choose and why? How has The Devastator positively impacted your life? The Devastator has an extremely positive impact on my life because it makes my brother happy, and that is very important to me. �(Awwwww.) �Also, it's very funny, so I'm always proud to tell people about it. �And to defend it to our father, who still "just doesn't get�it." Which Devastator article or comic tops your list of "Most Funniest?" Hi guys! �Help me convince The Devastator's staff that they should let me make a reality show about them! �Also, please get all your friends, family and acquaintances to subscribe to The Devastator -- not only because it's awesome, but also because it will make my brother wealthy. �Thank you.